When purchasing furniture think multifunction. Use an ottoman that offers storage space and can serve as a coffee table. Another idea is to use a console table that stores items on top, inside drawers and below. An oversized mirror is a great way to make a room look larger. A mirror that reflects an entryway brings in natural light. Mirrored furniture also look nice. 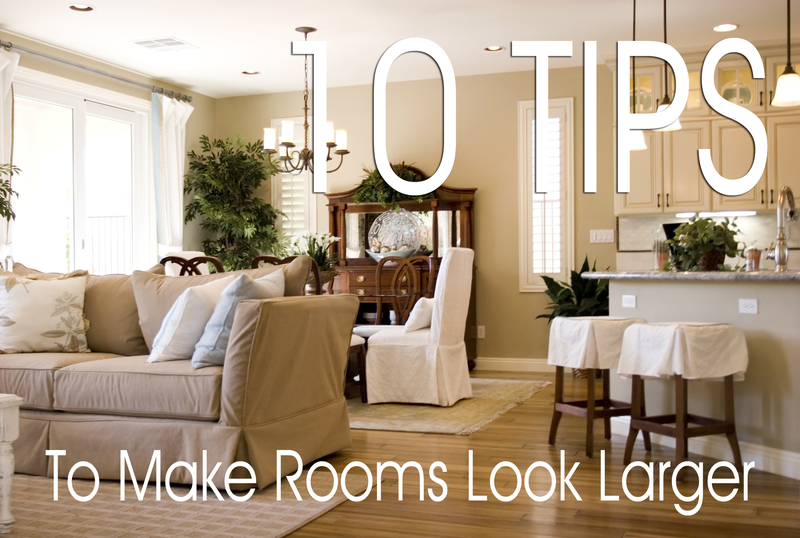 Look for furniture pieces, such as dining room tables, that can fold down and save space. Painting walls, trim and other detailing shades of one color can help to make a room appear to be larger. Use just a few large-scaled pieces of furniture instead of lots of smaller pieces. Also, furniture with raised legs make a room look more airy. Dark ceilings create depth, pull the eye up and create an illusion of height! Group items by color and height. This streamlines clutter. If you have area rugs, consider having them custom cut to fit around odd spaces (such as fireplaces.) This will make the room look more cohesive. This entry was posted in Home Maintenance, House Trends, Selling A Home and tagged home decor, make rooms appear larger, make rooms look larger, make small rooms look larger by susanaknabe. Bookmark the permalink.